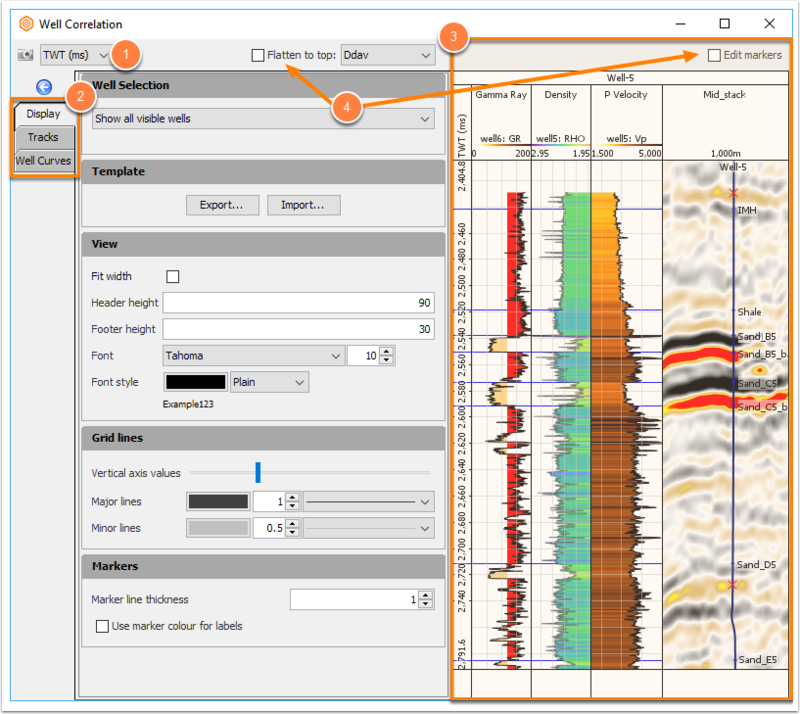 Well Correlation View and Single Well View use Well View Templates to build and customise the display of well log data. Templates are compatible between both types of views and can be saved to disk and shared between projects. Single Well View displays one well at a time. Use the control at the top of the window to change wells. 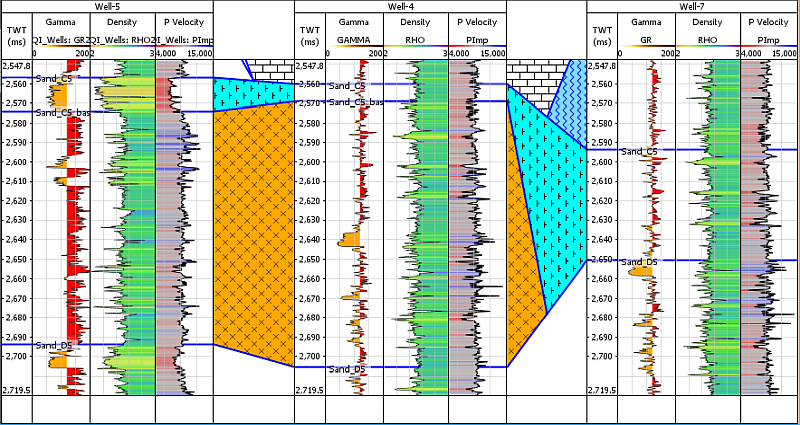 Well Correlation View displays one or more wells for comparison and stratigraphic interpretation. Both views work from wells loaded in the current session. Read more about wells here (Wells Overview). Both views are opened from the Control panel. From the Control Panel > View menu, choose New Well Correlation or New Single Well View. Select the display domain: MDKB, TVDSS, or TWT. Note: In TWT, well data is converted to time using the well time-depth set. Select a tab to update settings for Display, Tracks and Well Curves. 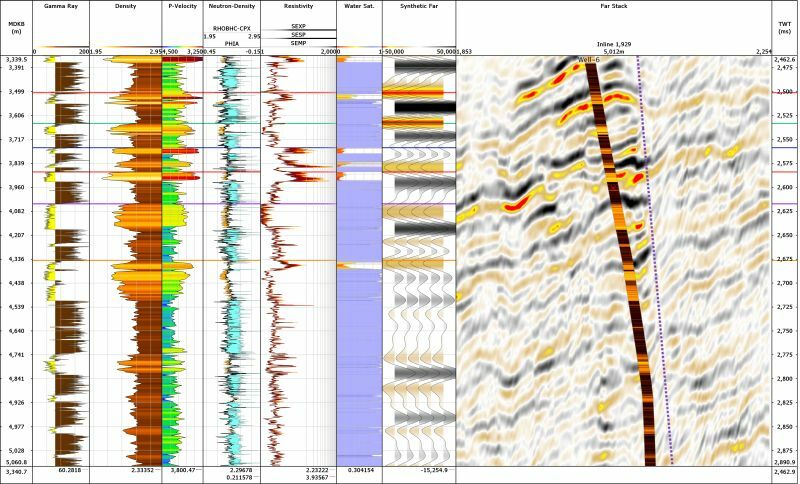 The panel on the right shows the results of the template for the current well(s). Flatten to top: enable this box and select a marker to align the wells to a common depth marker (see Flatten to Top). Edit markers: enable this box to edit markers directly in the view. To read more about editing markers, see Editing Markers (Well Correlation View). Select the Current Well from the dropdown search box. Flatten to top and Edit marker options are not available in this view. Note: Click the blue arrow to hide or show the configuration panel.